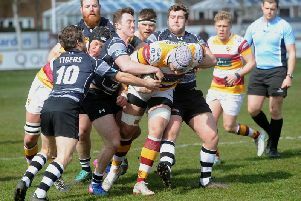 Warren Spragg believes the pressure is off his Fylde RFC team away to runaway leaders Coventry on Saturday, which could help them pull off the biggest shock of the season. Head coach Spragg acknowledges that most neutral observers will expect nothing other than a crushing home win as his bottom-placed club, who have lost seven successive National One fixtures, visit the Coventry front-runners, beaten only once all season. Spragg told The Gazette: “Everyone outside our immediate group expects us to be hammered by a team with a massive budget and a deep squad, who are planning for the Championship. “But the fact no-one gives us a chance takes the pressure off and changes our focus. We can concentrate on our own processes and the little things we can control, like positioning at kick-offs or lineouts on halfway. But even if tomorrow’s match does not produce a massive upset, Spragg says his belief in Fylde’s survival prospects will be be undiminished. Chris Briers is to be given another week to get over his broken arm, though the Fylde backline will be boosted by the return of winger James Bailey after hamstring issues. That could mean a couple more changes to freshen up the back division. Spragg was considering switching Tom Carleton to full-back and Alex Dolly to scrum-half, which could mean a rest for Greg Nicholls.